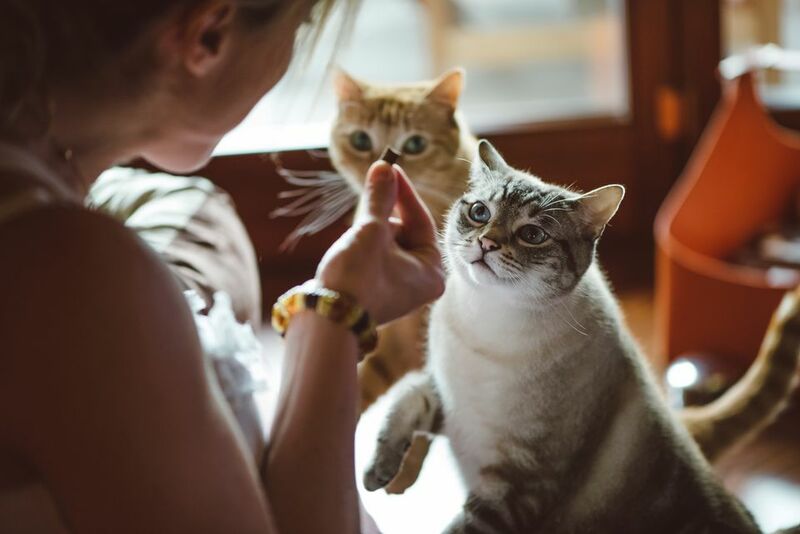 Some cats will beg and plead for human food, especially when they see you eating. Giving your cat any table scraps or tidbits of human food is a dangerous practice that should not be encouraged for multiple reasons. First, cats need the nutrients that are specifically provided for them in good, premium cat foods, and any "extras" that they consume will take away their appetites for their regular meals. A sliver of turkey or chicken from your dinner plate certainly won't kill a cat, but you're helping it develop bad habits. The main reason to discourage feeding cats "people food" is that there are a number of foods that are toxic to cats. While it is tasty and harmless to humans, a simple nibble could be life-threatening for your cat. If you are a cat owner, it's important to familiarize yourself with the everyday foods that can be dangerous, and even deadly, for cats. These foods are members of the Solanaceae family of plants, which includes the Deadly Nightshade, and contain a bitter, poisonous alkaloid called Glycoalkaloid Solanine, which can cause violent lower gastrointestinal symptoms. The leaves and stems are particularly toxic. Don't worry if you see tomatoes included in pre-made pet foods. They are made with ripe tomatoes and should cause no concern because they appear in relatively small amounts. While it's widely known that chocolate is dangerous for dogs, it's also toxic to cats. Theobromine is the offending substance and can cause chocolate toxicity in a cat. This substance is found in the highest concentration in dark and unsweetened chocolate. These foods' toxicity has mainly been found in dogs, in quantities of varying amounts. The ASPCA advises: "As there are still many unknowns with the toxic potential of grapes and raisins, the ASPCA Animal Poison Control Center advises not giving grapes or raisins to pets in any amount." There is no reason to risk a dangerous situation, so it's best to keep these fruits away from your cat. While avocado is healthful for humans, it is mildly toxic to cats. The leaves, seed, tree bark, and the fruit itself contain Persin, which can cause vomiting and diarrhea in cats. Be especially aware if you have a bowl of guacamole out at a party. You do not want your cat eating any of this snack or licking a spoon or fork that was used to make it. All types of alcohol can be toxic for pet cats. While a small lick of an alcoholic beverage is not lethal, consuming a lot can be. If you are hosting a party and serving alcohol, be sure to thoroughly clean up the drinks and avoid leaving large punch bowls or open alcohol containers overnight, as your cat might be prone to consume more. Onions contain a substance (N-propyl disulfide) that destroys red blood cells in the cat, causing a form of anemia called Heinz body anemia. Garlic contains a similar substance in a lesser amount. It's not likely that a small amount of garlic or onion cooked into a sauce will cause problems for your cat. It can be dangerous for them to consume a full clove of garlic or any large pieces of raw onion and will likely cause an upset stomach. There are a number of foods that are not toxic to cats, but they should be avoided. Meat trimmings, raw eggs, and caffeinated beverages should not be consumed by pet cats. Although milk is not toxic to cats, it may have adverse effects. Adult cats that are fed a nutritious diet don't need milk. Also, many cats are lactose-intolerant, which means that the lactose in milk and milk products produces stomach upset, cramps, and gassiness. If your cat loves milk and begs for it, a small amount of cream may be okay, two or three times a week. (The more fat in the milk, the less lactose it contains.) Another compromise is CatSip, a product made from skim milk with an enzyme added that helps the digestion of lactose. Catsip is available in supermarkets, pet stores, or online retailers. Xylitol, a sweetener, is deadly to dogs and can cause hypoglycemia and potential liver failure. The Pet Poison Helpline has not indicated its toxicity to cats, but it does not seem worth the risk. If you see this ingredient in any food items, make sure to avoid sharing with your cat. Contact your veterinarian or the ASPCA National Animal Poison Control Center right away at 1-888-426-4435. Share any information you have, including what they might have eaten and the symptoms you are seeing. There may be a charge for speaking with the poison control line.